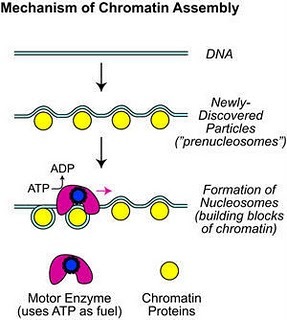 "This novel particle was found as a precursor to a nucleosome," said James Kadonaga, a professor of biology at UC San Diego who headed the research team and calls the particle a "pre-nucleosome." "These findings suggest that it is necessary to reconsider what chromatin is. The pre-nucleosome is likely to be an important player in how our genetic material is duplicated and used." These pre-nucleosomes, the researchers say, are converted into nucleosomes by a motor protein that uses the energy molecule ATP. "The discovery of pre-nucleosomes suggests that much of chromatin, which has been generally presumed to consist only of nucleosomes, may be a mixture of nucleosomes and pre-nucleosomes," said Kadonaga. "So, this discovery may be the beginning of a revolution in our understanding of what chromatin is." "The packaging of DNA with histone proteins to form chromatin helps stabilize chromosomes and plays an important role in regulating gene activities and DNA replication," said Anthony Carter, who oversees chromatin grants at the National Institute of General Medical Sciences of the National Institutes of Health, which funded the research. "The discovery of a novel intermediate DNA-histone complex offers intriguing insights into the nature of chromatin and may help us better understand how it impacts these key cellular processes."